What today is more like the usual image of a road, was once actually only a narrow alleyways. Due to the devastation in the heavy bombing in April 1944 on Grötzingen the streets of this small passage between Krumme Straße and Town Hall Square fundamentally changed. The northern side has almost completely disappeared after removal of debris and offered the opportunity to expand on the current road width. On the south part of the building was rebuilt. The little street was passable only for pedestrians and handcarts or later for cyclists and once served as a link between the former Central, current mayor Pine Street and today's Crooked Road. There they came to the place where the milk for a long time was kept cool with fresh spring water to sale. Also there was a calibration wells, where the official certification of the barrels was made??. Therefore, the streets was some time also Siegelgässle. Also here was the so-called poor house, lived in the both the gravedigger and the artisans stayed, who passed on their migration. Seen from the town hall, stood immediately left the town savings bank. To facilitate the farmers to deal with the money economy, originated in the 19th century in many places private savings banks, in which the communities adhered to the funds deposited. 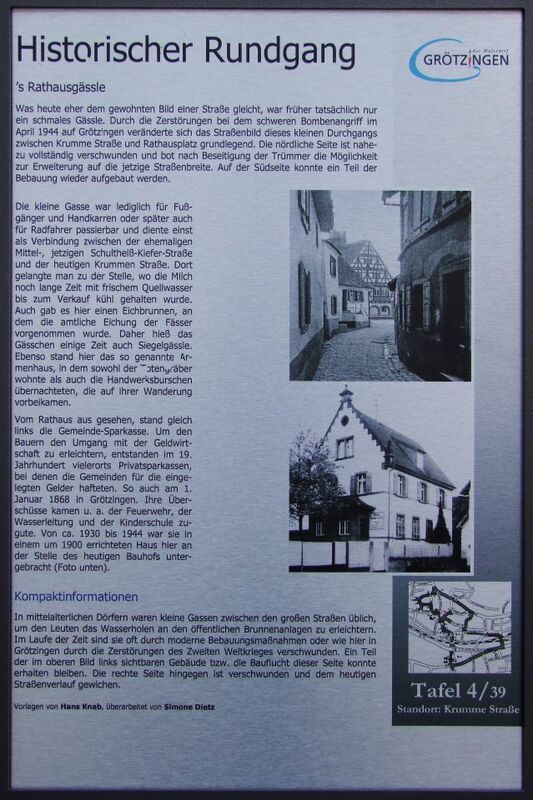 So also on 1 January 1868 in Grötzingen. Their surpluses were among others the benefit of the fire department, the water line and the kids school. From about 1930 to 1944 it was housed in a building built in 1900 here at the site of the present building yard (photo below).